I used to watch Melrose Place religiously. I have no shame admitting that, hell everyone watched it. I always thought the Daphne Zuniga was gorgeous. Before Melrose she had made a handful of films. Space balls being the most well know of the bunch. 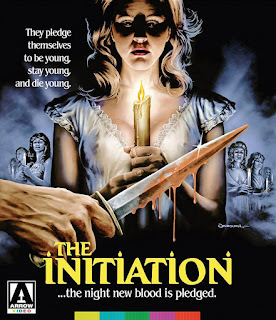 Her first starring role however was a small little film from 1984 called The Initiation from New World Pictures. It’s a really well made film that sadly got overshadowed as it opened around the same time as the original Nightmare on Elm Street. Its had a few DVD and VHR releases over the years, and has managed to gain a nice cult following. The fine folks over at Arrow Video took notice of this and have released it for the first time on a beautiful transfer Blu-ray. Initiation is the story of Kelly Fairchild (played by Zuniga) she suffers from recurring dreams of a man burring to death in the home she grew up in. Also she is pledging a sorority in which her initiation ritual will be breaking into her dad’s department store with the other pledges. It always made me wonder, if her dad did not own a big store what would they have done for an initiation? Anyway well the girls are preparing to do this we find out that there is a looney bin a few miles away where an escape has just occurred. We know all this because they call Kelly’s parents to tell them. That night the girls and a few of their boyfriends break into the store as planned and strange things start happening. Well not really strange, more like murder. See there is a killer on the loose, remember the breakout of the sanitarium? As this is all happening Kelly’s graduate Assistant Peter, who has been helping Kelly with her term paper detailing her dream, and partial amnesia she suffered has found out who the man in her dreams is. I would tell you more but that would ruin it. I can promise you, if you have never seen it, it has a great ending. The film is very good. Well made, well-acted, and perfectly paced. Lots of great FX including death by harpoon, elevator, roof fall, stabbing, you name it. Over in the UK almost a full minute of just gore shots had to be cut for the film to pass the ratings board. It truly is one of the great horror films from that era in my opinion.